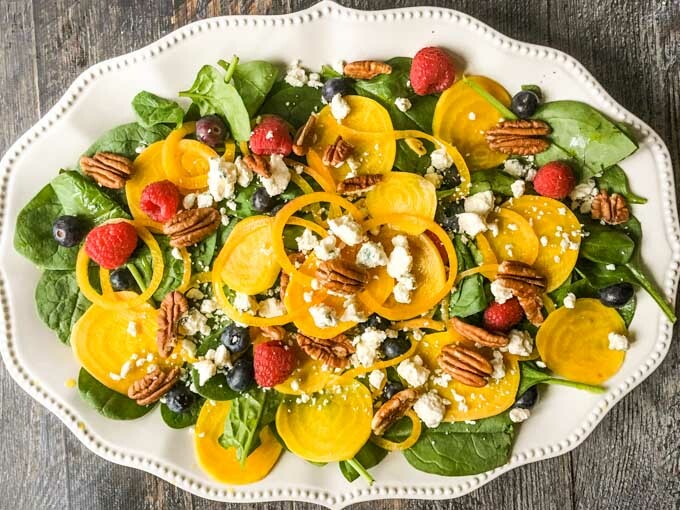 This pickled beet & gorgonzola spinach salad is full of delicious and nourishing ingredients such as berries, pecans, spinach and more. Perfect for a dinner party or to just brighten your day. Recently I was shopping and came across some beautiful golden beets. I like beets and the colors always get me. So I bought a bunch and the first thing I wanted to try was to pickle them. They turned out really good so I then went on to build a beautiful salad showcasing them. That is how I came up with this pickled beet & gorgonzola spinach salad. 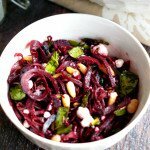 It consists of baby leaf spinach and topped with pickled beets and onions. Then I added some fresh raspberries and blueberries along with a few pecans and crumbled gorgonzola cheese. 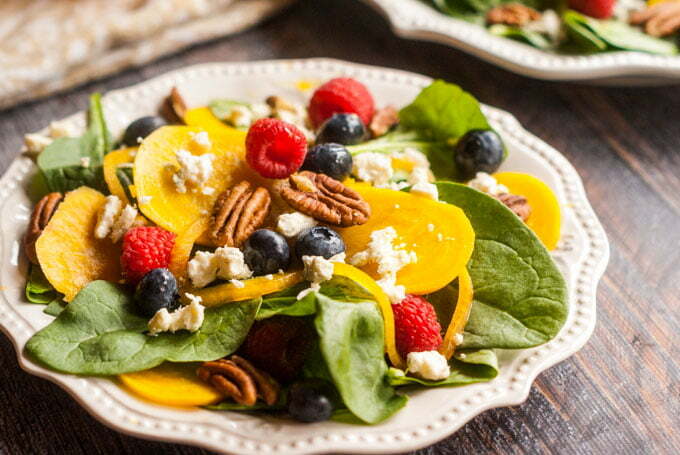 This delicious salad tastes tangy, tart, sweet, crunchy, creamy and nutty. It has it all! I love salads, especially ones with great toppings. 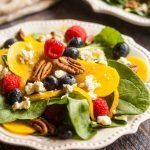 Fruit, cheese and nuts are a perfect combination in any salad so I picked a few of my favorites: pecans, gorgonzola, blueberries and raspberries. As for the pickled beets, I used my husband’s pickled jalapeño recipe and pickled them the day before. I also added some thinly sliced red onions. I hurried up and took a picture of them before I ate them all. They add a nice tang and crunch to salads and sandwiches, though I like to eat them straight out of the jar. 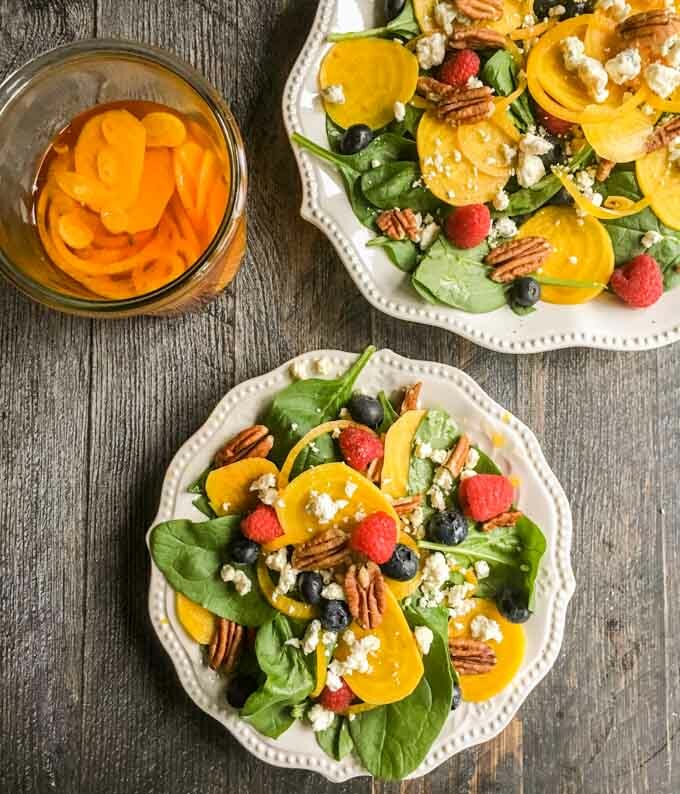 The dressing is the same as the dressing I used on my apricot pecan kale salad. It’s just olive oil, white balsamic vinegar, soy sauce and honey. 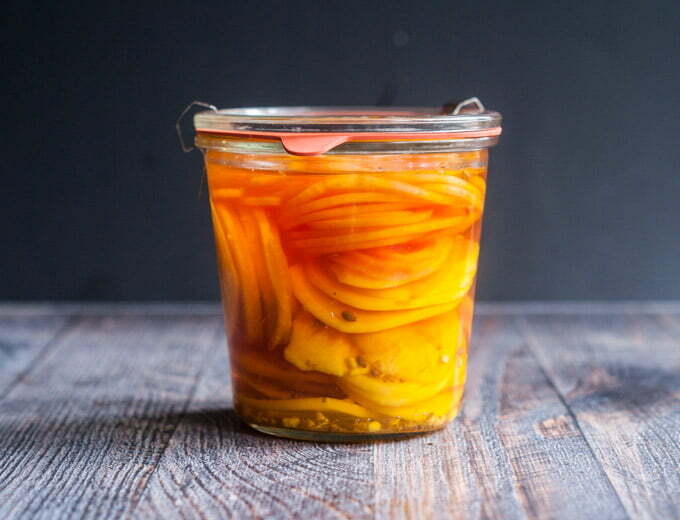 It’s light but with a touch of sweetness and goes well with the tart fruit and tangy beets. I didn’t dress the salad but rather served the dressing on the side. This would be a great salad for a dinner party or you can make it a main dish by adding some grilled chicken or salmon on top. I hope you give this recipe a try. Thinly slice your favorite vegetables, pickle them with some onions and store in your refrigerator. 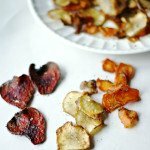 They taste great on salads and sandwiches as they add another layer of flavor. You can also change up the fruit, nuts and cheese. Try some strawberries, almonds and goat cheese or apples, walnuts and feta. The possibilities are endless! Enjoy. 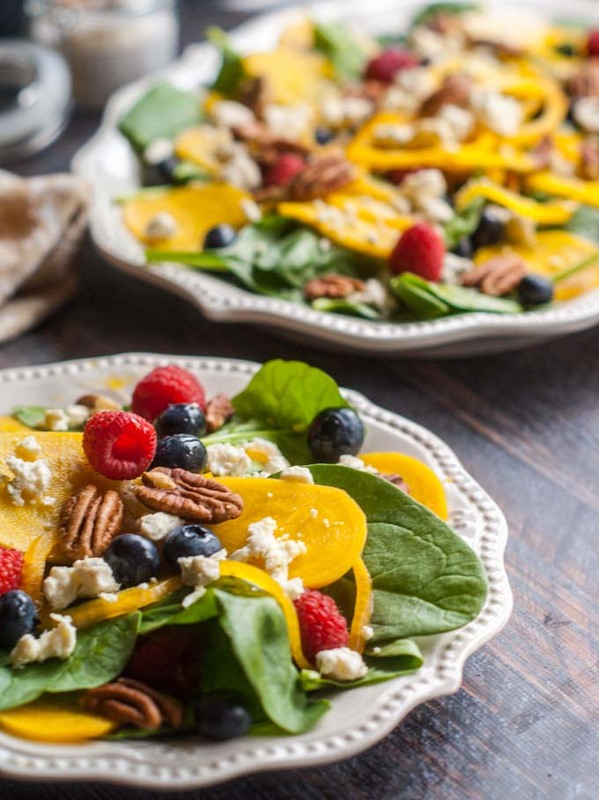 This pickled beet & gorgonzola spinach salad is full of delicious and nourishing ingredients such as berries, pecans and more. Add all the pickling ingredients into a large pot and bring to a boil. In the meantime add your beets and onions to a canning jar. When the pickle solution has boiled, pour it over the beets.You may have extra pickling juice so either throw away or save for another jar. Let pickled beets cool and then add a lid and put in the refrigerator over night. The next day arrange the spinach on a large platter. Layer some of the beets and onions on top and then continue with the berries, pecans and gorgonzola and set aside. Whisk the olive oil, vinegar, soy sauce and honey in a bowl and serve along with the salad. 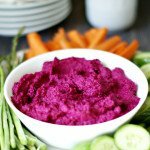 More beet dishes to try!